Jimmy and I came here on one of those idyllic hot days that filled July 2006, which we'll always remember. We had brought our bikes on the train up to Gunton station, and this was our first stop on a long, wide, stopping curve that would eventually bring up to Worstead about three hours later. I had been looking forward to coming to Thorpe Market for a very long time. 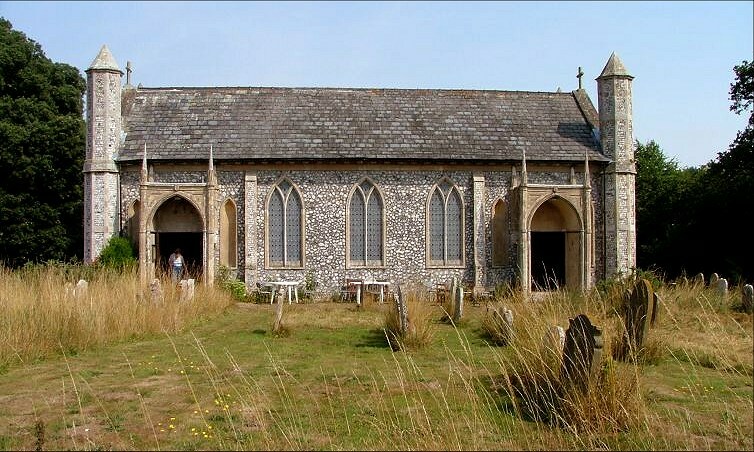 It was built at a most unusual date, 1796, when almost no other churches were being built in East Anglia. More than this, the use of 'Gothick' is mature, with a number of ecclesiological features which anticipate the Oxford Movement and the Camden Society by almost half a century. These include tall, blank image niches, which flank the two south porches and are also set in the west and east walls. 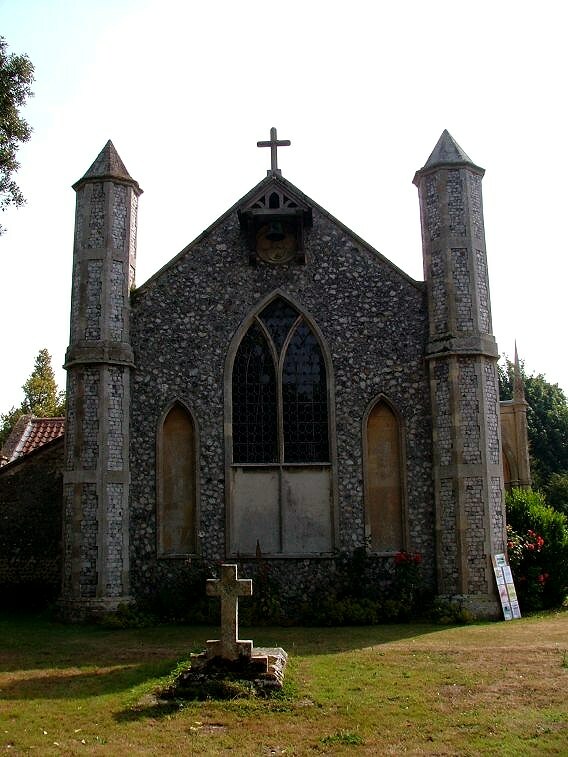 The porches are more typically 18th century, with spiked pinnacles which echo the towers at each end. 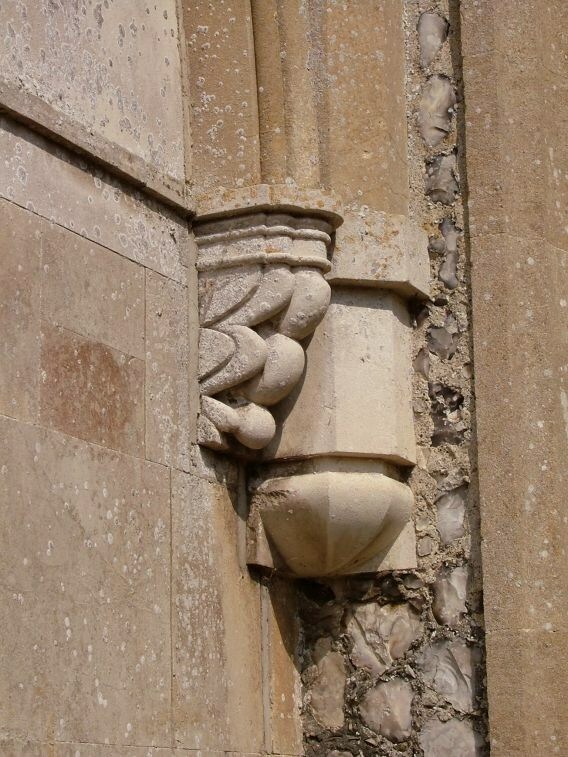 The church is broadly symmetrical about the centre, with the east and west ends being identical. 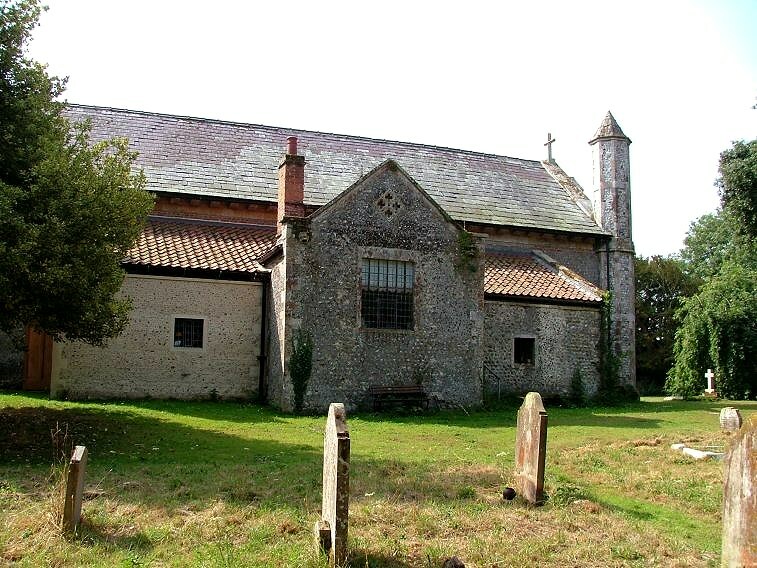 The great mystery about St Margaret is who the architect was. 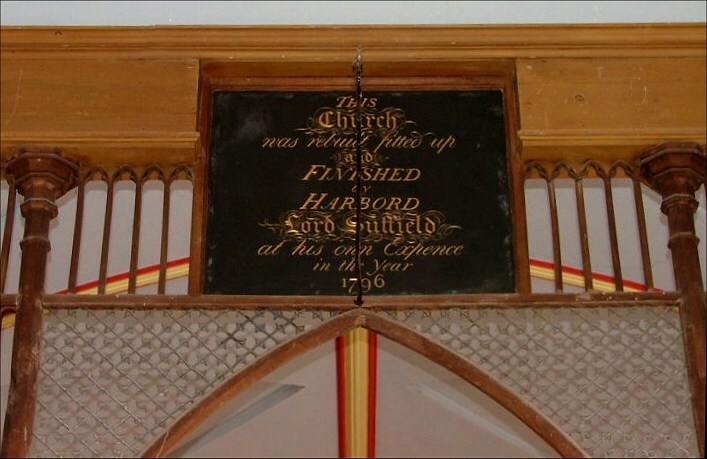 A plaque inside reads This church was rebuilt, fitted up and finished by Harbord, Lord Suffield, at his own expence in the year 1796. Now, no one is suggesting that Lord Suffield, of Gunton Hall, built it with his own hands, or even drew up the plans. Indeed, the work was designed by someone known simply as Mr Wood. 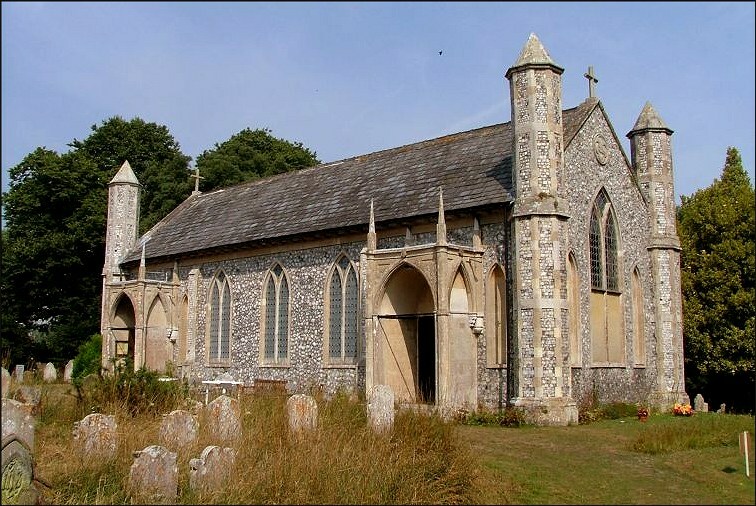 Nothing more is know about him, except that thirty years later Pevsner has him also designing the village school in much the same style. 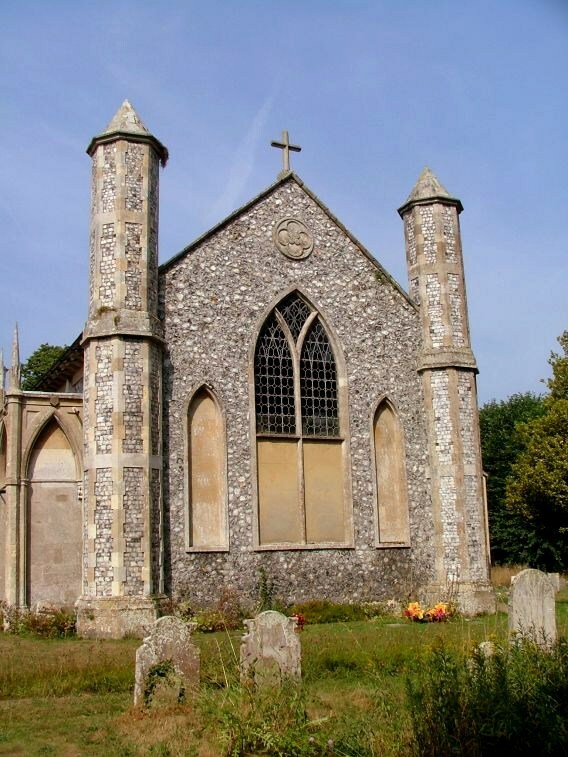 However, Pevsner goes on to point out that at about the same time an architect called Henry Wood was at work on a mausoleum at Blickling, so perhaps it is the same person. 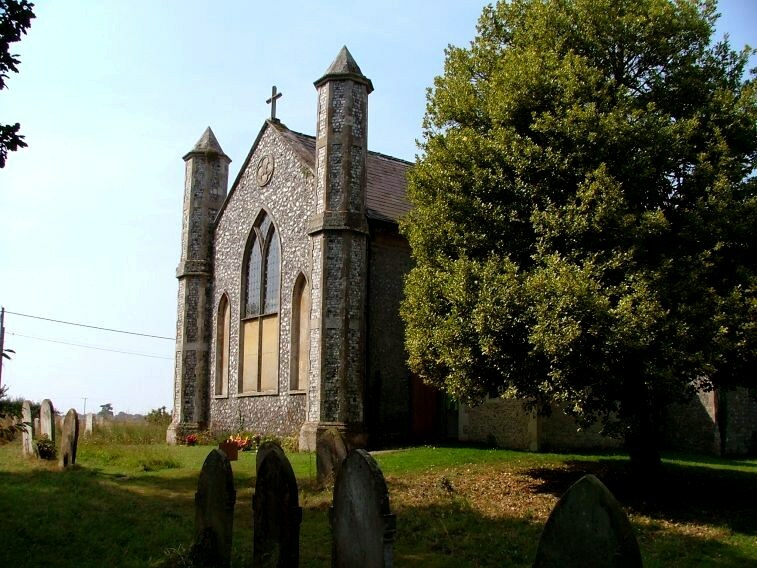 St Margaret is part of the wonderful Trunch Team Ministry group of churches, and as such makes itself open and welcoming. Indeed, famously, Thorpe Market church is open all the time. There are exceptions to this; it is often used for concerts and exhibitions, and is usually locked at times when these are not on, if the pictures and equipment are on the premises, so it is worth checking first if you are planning to make a visit. 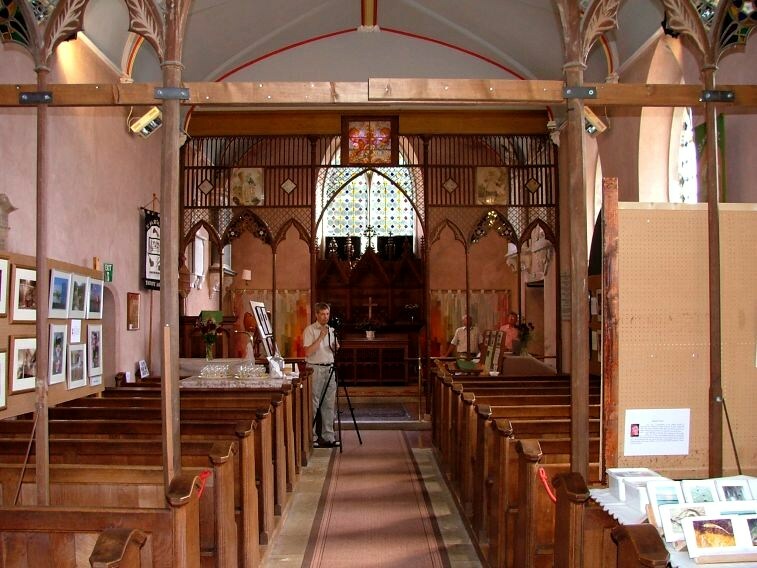 Jimmy and I arrived to find that a photographic exhibition was just starting - indeed, it had opened twenty minutes earlier - but everyone was very welcoming and very pleased that we were there, even though it was the church we wanted to see rather than the photographs. 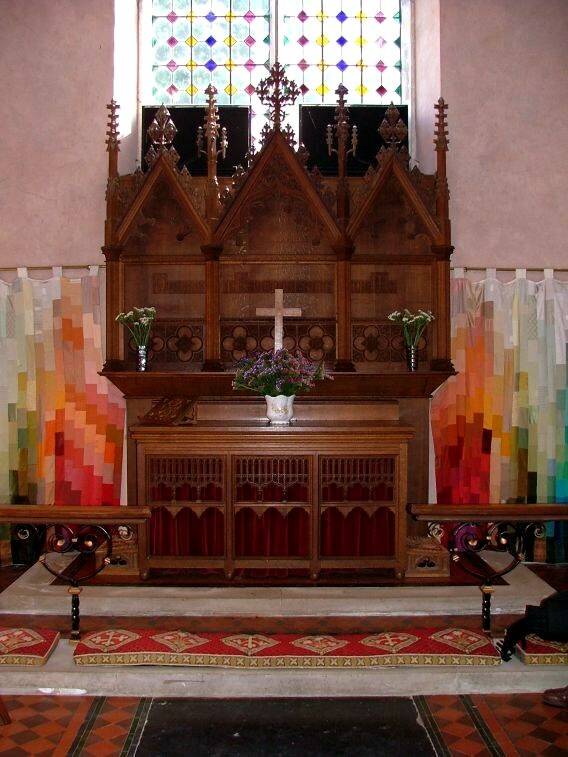 We stepped into a building with an atmosphere quite like any other church I know, with patterned glass from the original rebuiding still in place, and only the rather alarming Victorian sanctuary furnishings a later development. The church continues its symmetrical theme inside, with screens at both ends. These are all the more interesting for being late 18th century, and have painted glass work set into them. The royal arms in glass on the east screen, facing west, was originally in St Margaret at Lowestoft. 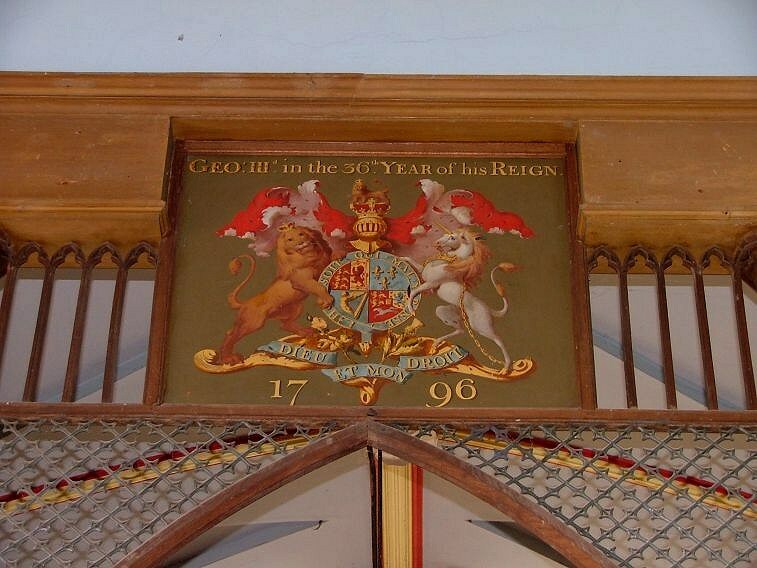 On the west screen are the original royal arms to George III, dated 1796. 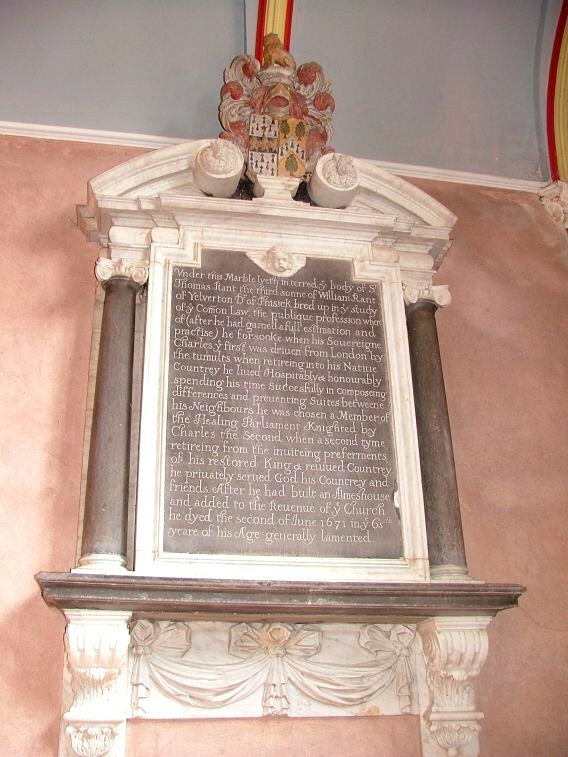 There are many memorials from the earlier church which this one replaced, including several to members of the Rant family, who we have already met at Marlingford and Yelverton. 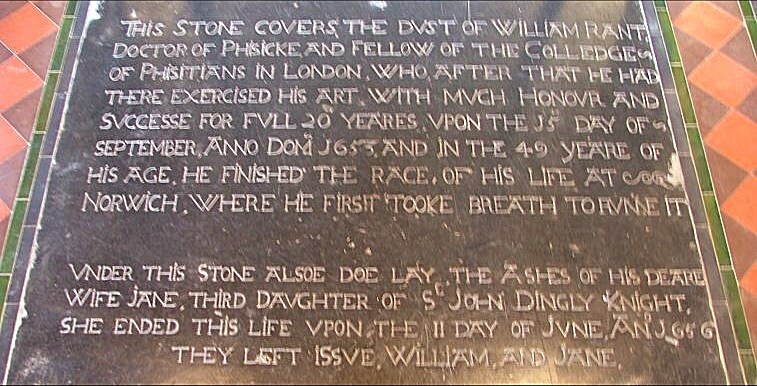 The best of these is a ledger stone with a wholly secular inscription from the middle years of the Commonwealth, which reads in part: This stone covers the dust of William Rant, Doctor of Phisicke, and fellow of the Colledge of Phisitians in London, who after that he had exercised there his art with much honour and successe for full 20 yeares... he finished the race of his life at Norwich, where he first tooke breath to runne it. 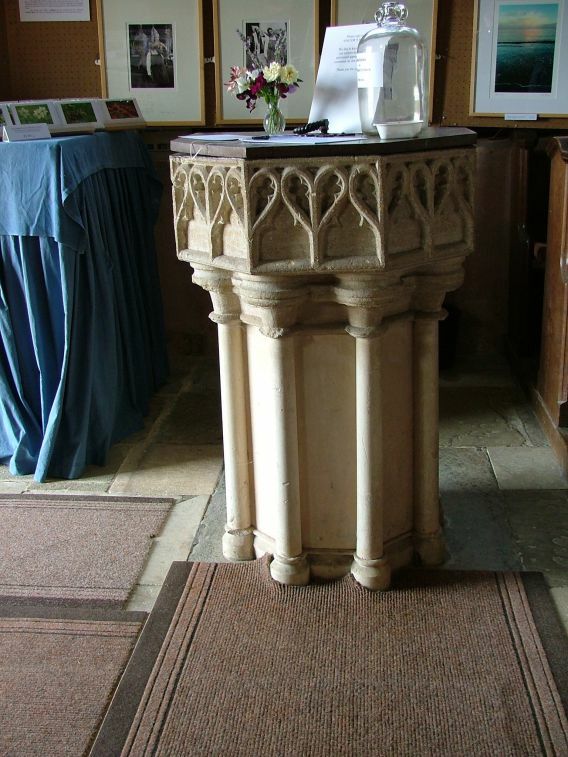 There is also the original medieval font, but mostly the church is notable for the unfamiliar feeling of the late 18th century, a really special place, quite unlike any other.